Auto physical damage insurance protects businesses from financial losses resulting from damage to autos they own or hire. It is usually provided as part of a business auto policy. Unlike auto liability coverage, which is mandated by state laws, auto physical damage insurance is purchased voluntarily. Should your company insure its vehicles for physical damage? The answer depends on a number of factors. First, if you lease or finance any autos, the leasing firm or lender will likely require physical damage insurance for those vehicles. Other relevant factors include the age and condition of your vehicles and the features they contain. These affect the value of your autos. Any insurance payment you receive for a physical damage claim will be based on the actual cash value of the vehicle prior to the loss. Autos lose value as they age, and older autos may be worth too little to insure. Two other considerations are the cost of physical damage insurance and your company's financial condition. If you decide to forgo insurance, be sure your business can afford to replace a "totaled" vehicle out of pocket. A commercial auto policy provides three options for physical damage coverage: Comprehensive, Specified Causes of Loss, and Collision. Comprehensive coverage applies to loss to a covered auto from any cause other than the vehicle's overturn or its collision with another object. Comprehensive coverage is designed to dovetail with Collision coverage. Most losses not covered under Collision are covered under Comprehensive. Examples are losses caused by windstorms, hail, fire, vandalism, or theft. A rock rolls off a hill and falls onto your pickup truck. The impact causes a large dent in the hood of your truck. A heavy pine cone falls onto the windshield of a private passenger vehicle you own, cracking the glass. You are driving a company truck when a deer runs out in front of you. You slam on your brakes but are unable to avoid colliding with the deer. The impact damages the front of your truck. Specified Causes of Loss coverage is available for commercial autos (trucks and trailers) only, not private passenger type autos. It covers loss due to fire, lightning, explosion, flood, theft, and a few other named perils. It is a cheaper alternative to Comprehensive Coverage. 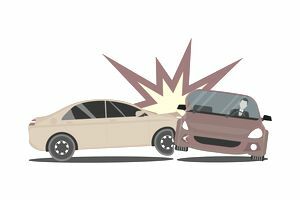 Collision coverage applies to loss to a covered auto caused by its collision with another object or the vehicle's overturn. The "object" with which an auto collides may be another vehicle or a stationary object such as a tree. If a covered auto sustains glass breakage in a collision accident, the glass breakage may be covered as a Collision loss rather than a Comprehensive loss. For example, suppose an employee of yours is driving a company truck during a heavy rainstorm. The vehicle skids on wet pavement and runs into a tree. The truck's windshield is smashed and its right front fender is damaged. Because a collision loss has occurred, you choose to cover the broken windshield under Collision coverage. This will ensure that both the windshield and the fender damage will be subject to one (Collision) deductible. If you elected to cover the glass breakage under Comprehensive Coverage, two deductibles would apply. The glass breakage would be subject to your Comprehensive deductible while the fender damage would be subject to your Collision deductible. When you buy physical damage coverage you can elect to cover all vehicles you own or a subset of those vehicles, such as private passenger autos only. You can also elect physical damage coverage for hired autos. The covered auto designation symbols shown in the declarations indicate the types of autos that are covered for physical damage. Wear and tear, freezing, mechanical or electrical breakdown. The last two groups of perils (wear and tear, blowouts, etc.) are excluded because they are considered maintenance issues. These exclusions do not apply to a covered auto that has been stolen. If the cost to repair your vehicle exceeds its actual cash value, your insurer will likely declare the vehicle a total loss. Each physical damage coverage is subject to a separate deductible. For instance, you may choose Comprehensive coverage with a $500 deductible and Collision coverage with a $1,000 deductible. You can reduce your physical damage premiums by increasing your deductibles. A loss payment you receive for a physical damage claim may be net of your deductible (meaning your deductible has already have been subtracted). Alternatively, the insurer may calculate your loss payment without the deductible and then bill you for the deductible amount.